Haystack Rock, at 235 feet high, is the third largest coastal monolith in the world. Haystack Rock is protected as part of the Oregon Islands National Wildlife Refuge as well as a designated National Wilderness Area. This 235 foot tall basalt monolith is located on the scenic Cannon Beach on the northern Oregon coast. The area below the rock is referred to as a Marine Garden. The boundaries of this area are between the extreme high tide line and extreme low tide line within a 300 yard radius from the base of Haystack Rock. That's the length of three football fields! The tidepools in the Marine Garden are dynamic areas rich with marine life such as seastars, anemones, crabs, algae, and many others. Collecting is strictly prohibited and it is crucial to be aware and use extreme caution while walking in these areas. The marine life in and around the Marine Garden is very vulnerable to human disturbance, and research shows that in a small area everything can be killed with just 200 steps an hour. So please be careful and try to walk only on bare rock. Barnacles are animals too! In addition to the diverse ecosystem of the rocky intertidal, Haystack Rock is a vital habitat for an abundance of seabirds. Here there over 2,000 seabirds that nest on Haystack Rock each year. While viewing the rock from shore you might see the Tufted puffin, Pigeon guillemot, Black oystercatcher, Pelagic cormorant and others. These birds are extremely sensitive to human disturbance. Getting too close to them can result in nest abandonment, dead chicks, and failure to reproduce. Climbing is not allowed anywhere on Haystack Rock, not only for the safety of the birds but for your safety as well! Federal and state law requires boats to remain at least 500 feet away and any aircraft (including gliders) must stay at a minimum of 2,000 ft. AGL. As one of the Oregon Coast's most popular destinations, Haystack Rock provides amazing opportunities to see all kinds of marine wildlife in their natural habitat. So please be mindful when enjoying this spectacular Oregon treasure. For hikers, there are many trails to the water through the thick conifer forests of Ecola State Park. Ecola Point, near Ecola State Park, has a viewpoint and picnic area, where you can see the whole panorama of Cannon Beach, Haystack Rock and the Coast Range. This spectacular view is one of the most photographed on the Oregon coast. A two mile trail connects Ecola point to horseshoe shaped Indian Beach, and a six mile trail leads on to Tillamook Head. 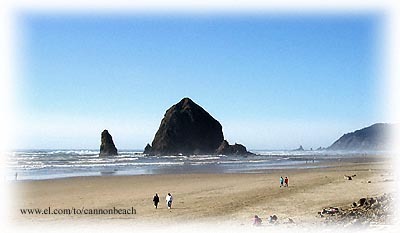 Relaxed simplicity and a magnificent natural setting attract visitors all year to Cannon Beach. It's a delightful place for a day trip, or to stay a while. Check out FotoArt for a gallery of Cannon Beach photography. Les Shirley State Park, the reputed southernmost point of the Lewis and Clark Expedition, is an attractive park near downtown and the beach, featuring open, grassy areas and picnic facilities.